Irving Fields was born Isadore Schwartz on August 4, 1915 in the Lower East Side, Manhattan. He began playing the piano at the age of 8. At the age of 15, he won the Fred Allen Radio Amateur Hour and was given a week engagement at the Roxy Theater. He attended the Eastman School of Music and while working on a cruise chip to San Juan, he became hooked on Latin rhythms. While in the army, he performed in the Special Services. He was signed to RCA as the Irving Campos Trio (Campos means “Fields” in Spanish) and began a prolific recording career- he has since recorded 80 albums, including Bagels and Bongos, Champagne and Bongos, and Bikini’s and Bongos. His song Miami Beach Rhumba sold over two million copies. Irving has played at Carnegie Hall, Symphony Hall, the London Palladium, the Roxy Theater, and the Eddie Cantor show in Las Vegas, and has appeared on the Milton Berle, Kate Smith, and Jackie Gleason shows. In the 60s, he returned to NY to begin a solo lounge career, including at 16 year stint at the Sheraton and 8 years at the Plaza and continued to release numerous recordings. Irving Fields died on August 20, 2016, he was 101 years old. The Idelsohn Society released Irving Fields “Bagels and Bongos” in 2005. 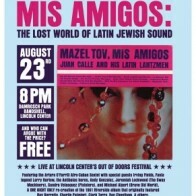 Irving has played our gigs at Joe’s Pub in NYC, the Mazeltov, Mis Amigos show at Lincoln Center, and the Jews on Vinyl Revue at the Contemporary Jewish Museum in San Francisco.